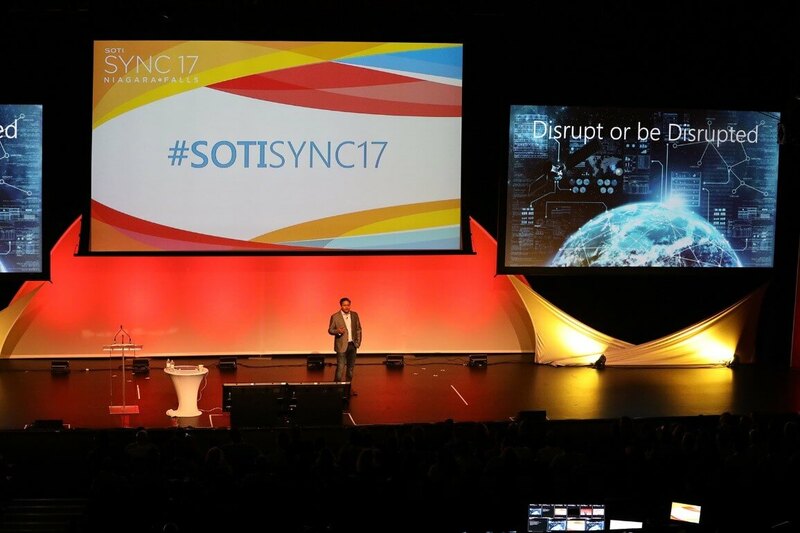 SOTI welcomed its global ecosystem of customers and partners to Niagara Falls, Canada for the company’s third annual SOTI SYNC conference from September 25-27, 2017. The three-day event gave attendees from around the globe an inside look into SOTI’s innovative roadmap, a forum to engage with the mobility industry’s top speakers and executives, and world-leading partners within the company’s ecosystem to collaborate and connect with. After a jam packed day of full hands-on training across 13 sessions, and exclusive invite only partner information sessions, the conference activities were well underway. For a recap, visit our blog post “An Inside Look into Partner and Training Day @ SOTI SYNC 17” for details. As the world shifts to mobile-first in both the consumer and enterprise space, a burgeoning new era of disruptive technologies are changing traditional operations, upending routine systems, and transforming the world as we know it today. Carl Rodrigues, President & CEO of SOTI presented on the conference theme “Disrupt or be Disrupted” during his engaging keynote, diving deep into the next realm of game changing technology, and SOTI’s unique focus on bringing all the core pieces together into one integrated platform, SOTI ONE. During SOTI SYNC, the company announced their position as the first Enterprise Mobility Management (EMM) solution to manage mixed mobility and IoT deployments, with the introduction of support for Linux. This is part of the newest update to the company’s flagship EMM product, SOTI MobiControl, available from October 31, 2017. “Mobility is changing the way we work. Businesses need to support mobile workers wherever they are – in the field, warehouse, storefront, or hospital room – no matter the form factor or OS. SOTI has been laser focused on empowering our customers to do exactly this for 20 years. Our newest version of SOTI MobiControl with Linux support is a powerful step along the important journey of enabling our customers to take full advantage of the next wave of mobility. Our proactive roadmap and delivery of visionary technology addresses the problems the enterprise will face, readying them for the mobile-first future with unmatched security and control,” said Graham Watts, Principal Product Manager at SOTI. ISARA CEO ISARA, Scott Totzke – The Quantum Era is almost here, are you ready for it? Popular sessions highlighted emerging technology trends in cybersecurity, augmented reality, and SOTI’s work to deepen its business-critical mobility expertise with the introduction of a unified platform approach. Attendees also had the flexibility to engage within SOTI’s partners within a showcase onsite, featuring new technologies including a vending machine powered by SOTI MobiControl running Linux. Gamification apps unlocked free giveaways, plenty of networking opportunities, and a wide array of information sessions took place. Amidst the action, SOTI’s customers and partners gathered for a night to remember. Attendees had the chance to relax, unwind, and experience Niagara Falls like never before at the Table Rock Welcome Centre in Niagara Falls, Canada. This jam-packed evening was full of networking opportunities, augmented realty experiences, Canadian cuisine, experiential activities including a “trip behind the falls,” and live music. To cap off the evening, spectacular fireworks lit up Niagara Falls for all guests to enjoy. Building on a 20-year history of supporting business-critical mobility, the company showcased its heightened growth at SOTI SYNC with more content than ever before. 2017 brought SOTI its largest year in revenue growth. The positive response globally demonstrates the strength and need for a platform like SOTI ONE. Join the conversation online. Follow SOTI’s social media channels for live event updates. Follow us on Twitter @SOTI_INC or on our SOTI company LinkedIn page.